How great that not all desserts have to be of the baked variety, or high in sugar and fat. Fresh fruits, especially in these warmer spring and summer months, simply prepared and given a little love and attention can be just as desirable a treat for the sweet tooth, and refreshingly healthy. It’s all about bringing out their natural flavors and dressing them up a little. 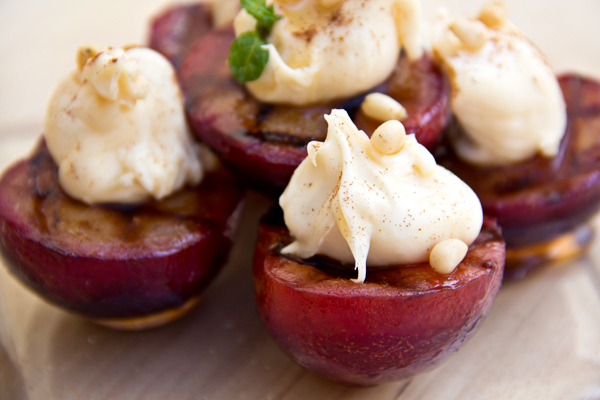 Plums are a gorgeous stone fruit, and grill oh-so well. Kissed with light spice and drizzled with sweet honey, they caramelize beautifully while being gently warmed and softened just a touch. They’re perfect as a fresh, luscious and simply elegant dessert, or as a unique side paired with a savory and spicy dish. I guess I’ll never really know if I’ve got some fruit bat genes in me, but that’s OK. As long as I can sit down with my fruit at the end of the day, I promise not to bite anyone. -In a medium bowl, toss together the halved and pitted plums with the vegetable oil, 1 tablespoon of the honey and the ¼ teaspoon of ground cinnamon; preheat a grill or grill pan over medium heat. 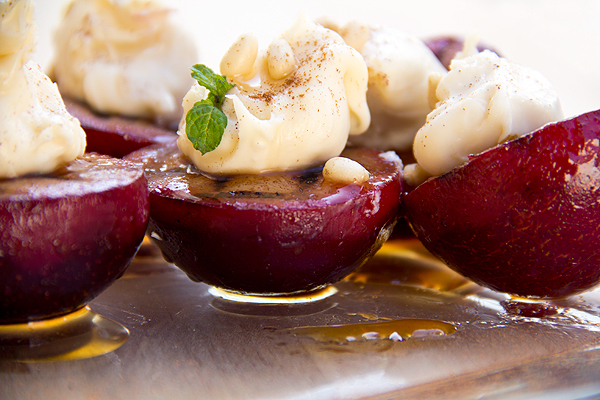 -Once grill pan is hot, place the plums cut-side down on the grill pan, grill for about 2-3 minutes or until they begin to caramelize and get “grill marks”, and are warmed through and juicy; remove from the grill and place onto a clean plate to keep warm while the sweetened mascarpone and vanilla honey are prepared. -In a small bowl, combine the mascarpone with 1 tablespoon of the honey and ½ teaspoon of the vanilla, and whisk together well with a fork until smooth and creamy, and set aside. -In another small bowl or a ramekin, combine the remaining 2 tablespoons of honey with the remaining ½ teaspoon of vanilla, and set aside. 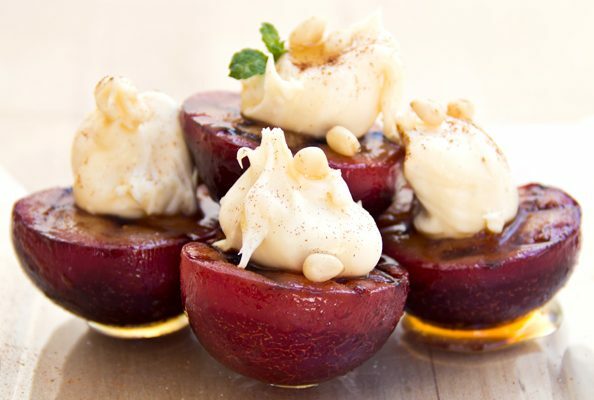 -Place 5 grilled plum halves onto each plate and spoon a heaping teaspoon size dollop of the sweetened mascarpone in the center of each plum where the pit was; with a spoon, drizzle a bit of vanilla honey over the plums, and sprinkle on a tablespoon of the toasted pine nuts over top; sprinkle over just a touch of ground cinnamon and garnish with a mint leaf. I like this because you used the grill! I don’t like to use the oven in the summer… I’m going to try this recipe soon! I loved grilled fruit. Have to admit that I’m not a big plum fan. These look fresh and light; I might have to give them another try. 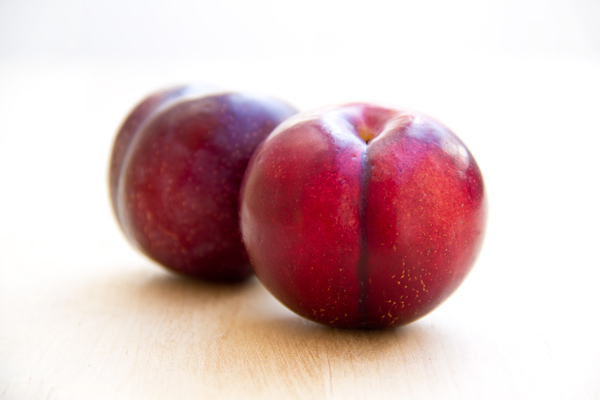 I’m sure they’d be just as good with another stone fruit – nectarines, peaches … you could switch out the nuts, too. Apricots and pistachios are a classic combo … especially with cardamom instead of cinnamon. Oh lord, I think I need to try that immediately! This is my kind of dessert! Simple, slightly sweet, and not overly heavy. I love how warm both your writing style and your photos are. Thank you, Sarah! And as far as the little platter, it’s from good ol’ Cost Plus World Market.